[Updated with video] Along with other HBCU Alumni, Bermudian Shiona Turini will be recognized for her “exceptional work” at the “Celebrating Successful HBCU Alumni Panel” to be held today [Feb 24] at the White House. This event — organized by The White House — is the latest in a string of accolades for the style expert, who most recently served as a stylist for superstar Beyonce’s latest music video. According to story on the Hampton University website “Celebrity stylist Shiona Turini, Hampton University alumnus, will be recognized along with several other HBCU alumni for their exceptional work at the ‘Celebrating Successful HBCU Alumni Panel’, on Wednesday, Feb. 24 from 1 pm – 4 pm in the Eisenhower Executive Office Building – South Court Auditorium. “This event organized by The White House will highlight HBCU alumni who are doing exceptional work in diverse fields including entertainment, fashion, business, and technology. “Honoring these alumni’s accomplishments personifies the very best of HBCUs and the numerous contributions of HBCUs to African Americans and American society at large. “The event will also feature remarks on the importance of HBCUs and the work being done to promote and sustain HBCUs under President Obama’s Administration. “John King, Acting Secretary of the Department of Education; Valerie Jarrett, Senior Advisor and Assistant to the President for Intergovernmental Affairs and Public Engagement, and Broderick Johnson, Assistant to the President, Cabinet Secretary, and Chair of the My Brother’s Keeper Task Force will be on hand for the event. 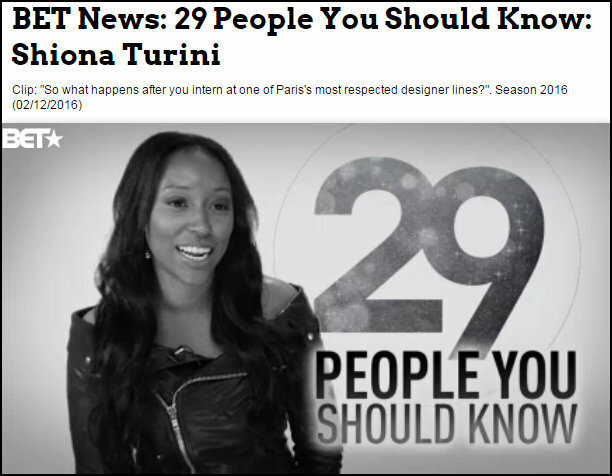 “Turini, a 2003 graduate of the Scripps Howard School of Journalism and Communications, has made an impact in the world of fashion. In addition to Ms Turini, the panelists will include Will Packer from FAMU. Marcus Noel from Morehouse College, C. Brian Williams from Howard University and Jaunice Sills from Spelman College. Update 2.53pm: The live stream is underway [you can watch above], with Ms Turini beginning her presentation by giving a ‘shout out’ to Bermudians. Thanks for being a great role model for young Bermudians like myself. You really help us to see that anything is possible with hard work and determination! Congratulations Miss Turini super achievement!!! Bermpp Berrmmmmppp Berrmmmmppp !!!!! This is an awesome headline for an extraordinary woman. Thank you for another proud moment, a a talented young Bermudian speaking in the white house. The year has just started for you. I look forward to seeing u succeed pass your wildest dreams. The universe is your play!!! This is worth celebrating and to know that she is one of our own is a reason to be elated, congratulations Ms. Turini, I know your family is extremely proud and they have every right to be. I hope you get to have your photo taken with The President and The First Lady. This is History being made and could not think of anything better then you having your photo with the first Black President as a Bermudian.Now how many other Bermudians can say that. This is black history month and yes of course we are extra proud because Dr. Martin Luther King’s Dream still is alive and well. Love it that’s what I’m talking about!! !